Had a great day - Kayaking and Dunn&apos;s River Falls - Excursion took us over to the falls, which we hiked up with dozens / hundreds of other people. Even with all the people there, they were pretty amazing and we had a great time. The actual walking up the falls part was really cool. We did the champagne cameraman wit a trip to the falls and snorkeling. We did the champagne cameraman wit a trip to the falls and snorkeling. I would recommend it. LOVED the excursion! Avoid climbing the falls if you have physical limitations. If you are not limited, CLIMB...it is awesome!!! Excellent spot just very crowded. Climbing and walking. Beautiful scenarios and you get wet. This is a once in a lifetime event. Really good guides and they take care of you. They do push for tips. The market place you have to go back through at the end of the tour is pushy as well. Still worth it! This was the Dunns River Falls and Dolphin Cove combination tour. Dunns River falls was pretty, but getting out was a hassle having to go through all of the shops and being haggled by everyone. The falls were a lot bigger than what we expected, but beautiful. We walked to the bottom of the falls then walked back up on the path beside the falls. We walked to the bottom of the falls then walked back up on the path beside the falls. Very pretty and was fun watching our fellow cruisers climb the falls. The falls were super fun, but extremely crowded. 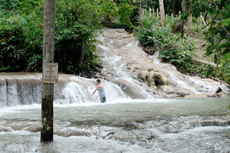 We did Best of Ocho Rios and visited Konoko Falls park and Dunns River Falls. I wasn't feeling well this day, and we had to return early from the tour. She drove us there but does not guide. You better be fit to do this. You better be fit to do this. There is no advance warning by the people that sell you this excursion onboard how challenging this might be for some people. Excellent guides hiking the falls. Excellent guides hiking the falls. Great photo ops. Easy pickup from port. Talley, the tour guide was the best. Went with the local cab drivers. Went with the local cab drivers. Was set up with a local guide, Floyd. Super funny and high energy guy as well as helpful.